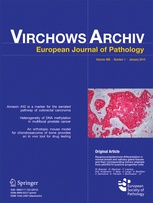 Virchows Archiv (European Journal of Pathology) is the Official Journal of the ESP. The Journal is edited by an editorial committee composed of an Editor in Chief, who is appointed by the Executive Committee, and Associate Editors, who are selected by the Editor in Chief. The mission of the Journal is to advance the scientific basis of human pathology by the publication of high quality research, including molecular and translational studies, and thereby contribute to patient care. The Journal publishes manuscripts of original studies reinforcing the evidence base of modern diagnostic pathology, using immunocytochemical, molecular and ultrastructural techniques, as well as (invited) reviews including an annual review issue. Furthermore, papers on critical evaluation of diagnostic criteria but also broadsheets and guidelines with a solid evidence base are published. Detailed information on Aims and Scope and Instructions for Authors are available at the Journal’s website!